A versatile artist of the underground scene, Thierry is a creator in constant migration, passing from one medium to another. From choreography to costume design, from painting to textile creations, Thierry creates a sprawling art that weaves links between his different practices. First trained in visual arts, Thierry then turned to dance, completing his professional training at the EDCM in 2008. His repertoire includes a dozen creations, including GENESIS, which was acclaimed by the public and critics alike. 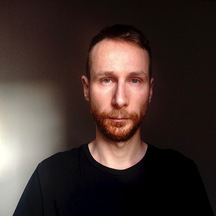 Over the course of his career, his work has been supported by several institutions including Cirque du Soleil Cultural Action, the Conseil des Arts et des Lettres du Québec, the Canada Council for the Arts, Circuit-Est Choreographic Center, EDCM, Studio 303, Tangente and Usine C. He approaches creation in an anthropological way by questioning our relationship to ourselves, to others and to our environment. His process is established by weaving links between the ways in which vestiges of ancient mores affect human behavior today.